Duncan Grant was a central figure in the circle of artist and writers known as The Bloomsbury Group, which included Grant’s cousin Lytton Strachey, Maynard Keynes, Roger Fry, Virginia and Leonard Woolf, Virginia’s sister the painter Vanessa Bell and Vanessa’s husband the critic Clive Bell. Duncan Grant and Vanessa Bell were closely associated in their professional and personal lives for more than fifty years. 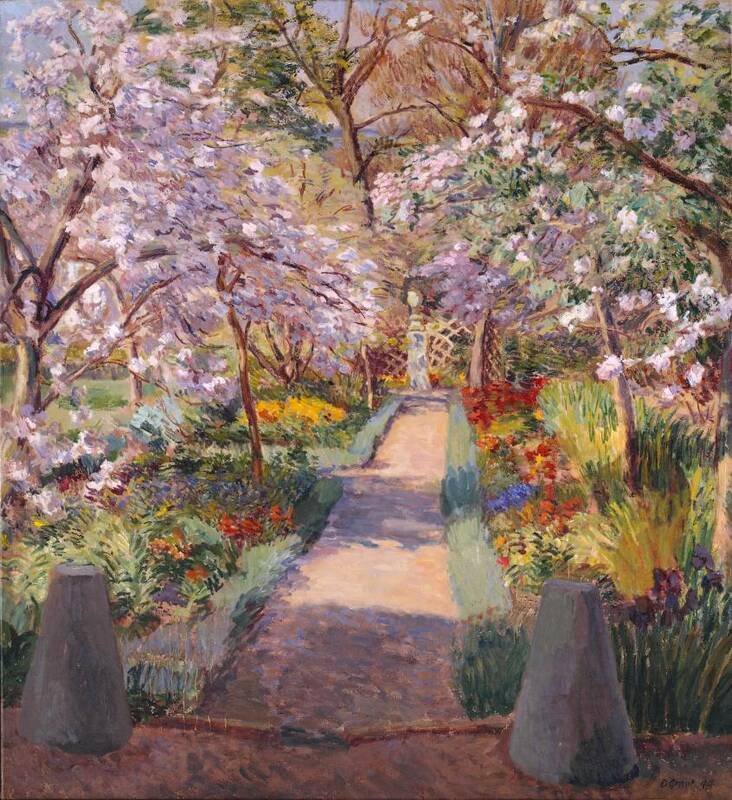 The garden depicted above was part of the estate at Charleston, a remote farmhouse at the foot of Firle Beacon in Sussex where Grant lived and worked with Vanessa Bell from 1916 until his death. Under previous owners the garden had been used for growing fruit and vegetables; under the direction of Grant and Bell, it was transformed into the very archetype of a delightfully disordered English cottage garden. Certainly the wider world is not alluded to in Garden Path in Spring, where the intimacy of the domestic garden setting is intensified by the crowded composition. Blocking out the views beyond and even the sky above, the voluminous trees and plants fill the entire canvas, while blossoming branches sweep inwards to form a protective shade. The extent to which Grant’s vision in the early 1940s was of an inward-looking, enclosed world is most apparent when the Charleston paintings are compared with his earlier, European, landscapes. As a retreat from war the garden at Charleston was an anomaly. Under the government’s ‘Dig for Victory’ campaign between 1939 and 1945, six and a half million acres of countryside had been ploughed up and transformed into productive, utilitarian allotments. Haphazard and superfluous, Grant’s flower garden was a rare luxury, and in some senses a rejection of the nationalistic language of wartime self-sufficiency, in line with his earlier pacifist response to the First World War. The detached, carefree and luxurious world of Charleston, enjoyed by its inhabitants and visitors, was to appear increasingly out of tune with modern British life, and in the post-war era of austerity and rationing Grant suffered a decline in his reputation. 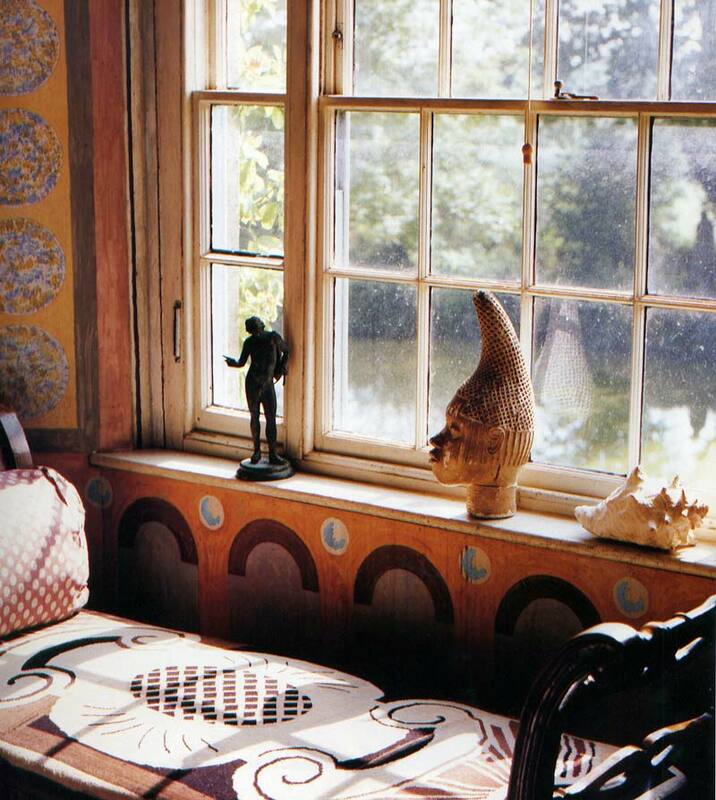 Duncan Grant’s bedroom at Charleston, with an east view over the pond. Perfect for now – an English idyll! It is all so very beautiful. Thank you Sigrun. Yes – He has captured the feeling of spring beautifully! Beautiful image for Easter week – and strangely similar to virtually all the paintings in the current David Hockney retrospective at the Royal Academy! Unfortunately I haven’t had the chance to see his exhibition, wish I had! You might enjoy the book Charleston: A Bloomsbury House and Garden, by Quentin Bell and Virginia Nicholson. I picked up a copy years ago at an exhibit here and it’s extremely detailed with Quentin’s memories and striking photographs and commentary of every inch of the home and grounds. Thank you! Sounds like a perfect book for me! Very lovely… and yes, it gives very much the sense of being tucked away in ones own world. I was very interested to hear about all that land being dug up and turned into productive farming- makes sense but I’d never thought about it! Thanks! This information about home-farming was new to me as well, actually I would like to know more about it. So not only a glimpse into an inner world but a world increasingly removed from a quicker, more practical pace. I, too, found the number of acres for the individual allotments staggering but then so was that war as are all wars. Yet another fascinating post, Sigrun. I am quite fascinated by the Bloomsbury Group; they were so ahead of their time. I got a chance to see the house at Charleston over the summer. I love how every inch of it was so colorful. Lovely post. I have not seen it yet, but I would love to visit. I studied architecture before I did my master in literature and art theory, and I very much like the idea of a “Gesamtkunstwerk” where every aspect of life is considered as also a field for/of aesthetics.